What does the evidence say about the links between housing and poverty? In an age of austerity, food banks and the bedroom tax, the links may seem obvious. A housing policy based on letting housing benefit take the strain – relying on private renting and rising affordable rents – at the same time as it is being cut looks like a pretty good mechanism for creating poverty. But evidence emerging from the Joseph Rowntree Foundation’s housing and poverty research programme (see my summary here) shows a relationship that is both more complex and more troubling. The housing system can act as a defence against poverty and deprivation (as it has in the past through social housing, housing benefit and the homelessness safety net) but it can also be a cause of them (as it did before through high housing costs and poor conditions). The latest homelessness figures confirm some disturbing trends over the last five years in why people lose their home and what happens to them once they get help. The statistics for England published by the DCLG on Wednesday run up to the end of 2014/15 and so allow the record the coalition to be assessed for the first time. The headline measure of households accepted as homeless (unintentionally homeless and in priority need) rose 36 per cent between 2009/10 (the year before the coalition took power) and 2014/15 to 54,000. But this figure is heavily influenced by other government policies, not just the coalition’s reforms of the system but the last Labour government’s too. For example, the acceptances figure was more than double what it is now in the early 2000s, before prevention and options approaches were widely adopted by local authorities. As the UK Housing Review briefing pointed out on Monday, combined acceptances and prevention cases (not published yet) are likely to top 300,000 in 2014/15 compared to just over 200,000 in 2009/10. And even these figures take no account of hidden homelessness, whether it’s overcrowding or concealed households or single people and childless couples who do not have priority or rough sleeping. If we have a Living Wage, why not a Living Rent? Well, now we do. With due respect to the Scottish campaign of the same name, the report launched this week by Savills, the Joseph Rowntree Foundation and National Housing Federation addresses directly what I’ve long thought to be perhaps the most important question in housing policy: how to make homes genuinely affordable to people on low incomes. Current policy gets nowhere near that. Employment may be at a record high but millions of people are trapped in low paid work, in part-time jobs and zero hours contracts, and average earnings have only just begun to rise again after years of decline. Yet private sector rents are too high, leaving families reliant on housing benefit whether they are in or out of work and vulnerable to cuts to come: projections by Savills suggest that one in four of us will be private renters by 2019. ‘Affordable’ rents are only affordable in relation to a market artificially inflated by speculative investment and the aftermath of the financial crisis. Even social rents rise by an inflation-plus formula regardless of what’s happening to earnings. 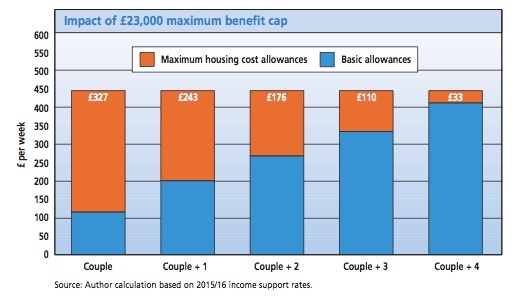 Could the Conservatives really admit they got it wrong on the bedroom tax? Hard as it is to imagine Iain Duncan Smith admitting he was wrong about anything, pressure is growing for a rethink. Note the lack of pretence that it’s really the removal of the spare room subsidy and that it’s all working brilliantly to save money and use social housing more fairly. If the opening salvoes are anything to go by, we are in for a long battle in the House of Lords over the right to buy. The Conservatives do not have a majority in the Lords. By convention peers do not vote against legislation that was in the government’s manifesto but that still leaves plenty of room for amendments. It’s also hard to see how the government could claim financial privilege to reverse Lords amendments, as it did with the Welfare Reform Act. Tuesday’s debate was only a short one on that bit of the Queen’s Speech but it was also a preview of the key themes that will be debated over the next few months and some of the key peers who will be making the arguments.